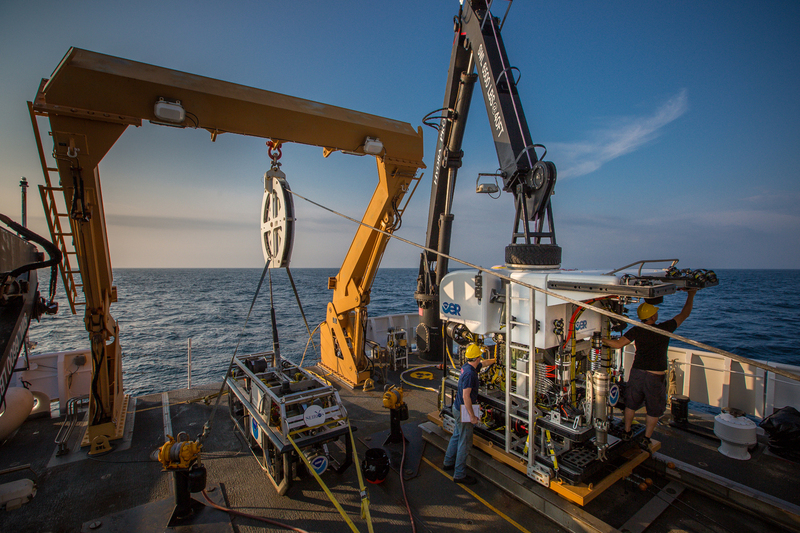 The expedition marks the second field season using NOAA’s 6,000-meter remotely operated vehicle Deep Discoverer and the Seirios camera sled and lighting platform on NOAA Ship Okeanos Explorer. When these systems are deployed from the ship, we will be able to provide scientists and the audiences onshore with real-time video footage from deep-water areas in important, yet largely unknown, U.S. waters. Image courtesy of NOAA Office of Ocean Exploration and Research. Download larger version (jpg, 1.7 MB). Despite its importance to U.S. national energy, food, transportation, and recreational economies and decades of exploration, significant gaps remain in our basic understanding of the deep Gulf of Mexico. In recent years, scientists and managers have identified poorly known areas in the Gulf of Mexico that are larger than the states of Connecticut, Delaware, and Rhode Island. Imagine – whole states, under water, still largely unexplored and poorly documented today! The 2014 Gulf of Mexico Expedition continues NOAA’s efforts with partners to reduce the unknown by conducting baseline ecosystem characterizations to support a variety of research, management, economic, and educational activities. The data we collect will provide critical deep-ocean baseline environmental intelligence to governments, universities, corporations, non-governmental organizations, and the public. 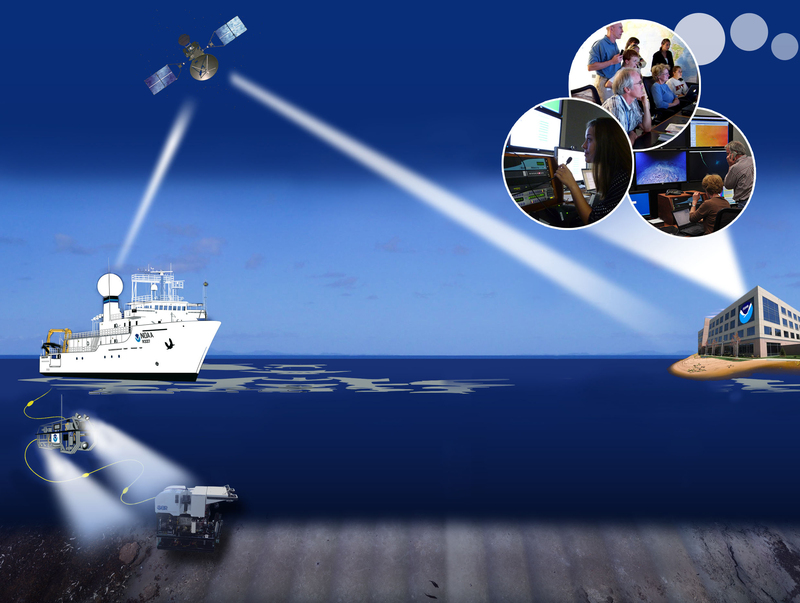 Our collaborative exploration approach utilizes telepresence technology to stream real-time video and data ashore, allowing scientists, engineers, managers, and students to work together efficiently to characterize sites, learn from one another across disciplines, and share knowledge and new discoveries with anyone watching on the Internet. Before (top) and after (bottom) map showing the focused operating area for Leg 1 mapping operations on the southwestern part of the West Florida Escarpment. 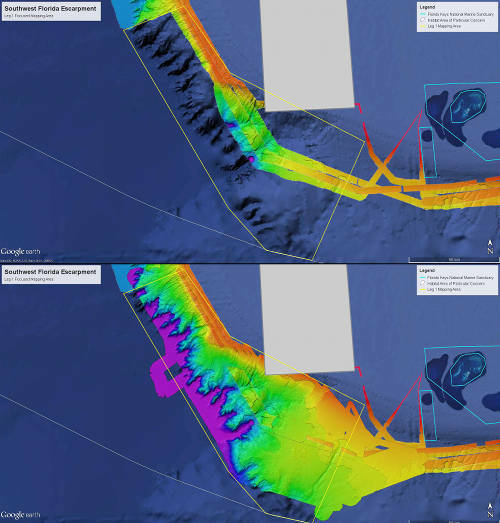 Bathymetry shown in the above map is from 2011-2012 operations; the “after” map shows bathymetry collected from February to March 2013. The area was identified as high priority for mapping operations by multiple management groups. The white line is the U.S. Exclusive Economic Zone. Image courtesy of NOAA Office of Ocean Exploration and Research. Download larger version (jpg, 1.4 MB). From April to May 2014, a team of scientists and technicians both at-sea and on shore will conduct exploratory investigations on the diversity and distribution of deep-sea habitats and marine life in the Gulf of Mexico. We expect to have a live Internet connection to allow the world public to ‘join’ the team in making real-time discoveries from hundreds to thousands of meters below the ocean surface. The 59-day expedition, of which the April-May interval is the last installment, is divided into three ‘legs’ and includes operations on the continental slope and adjacent deep-water areas in the Northwest Gulf of Mexico and the West Florida Escarpment. Starting on February 24, scientists and technicians began mapping the seafloor using Okeanos Explorer’s deep-water multibeam, single beam, and sub-bottom profiling sonar. 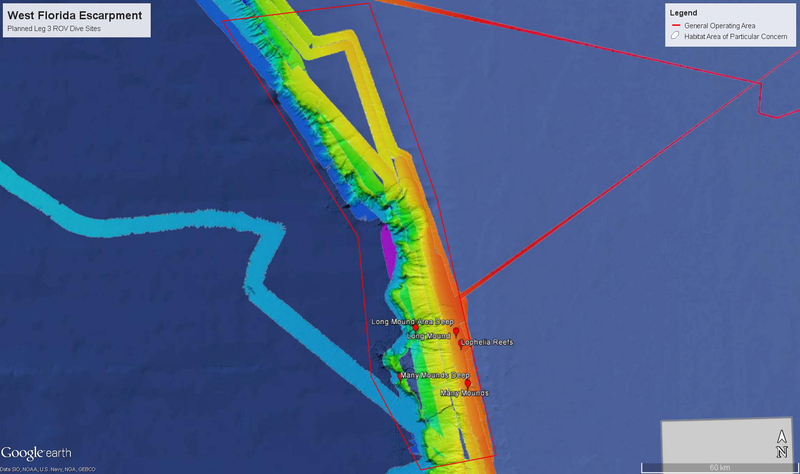 Leg 1 operations focused on mapping an area of the southwest Florida Escarpment where multiple management groups expressed interest in baseline bathymetric data. Leg 2 operations focused on mapping deep-water areas south and southeast of the Flower Garden Banks National Marine Sanctuary, providing critical baseline information to support follow-on exploration and research activities. Starting on April 10, Leg 3 operations will focus on exploring the diversity and distribution of deep seafloor habitats in the Northwest Gulf of Mexico and on the West Florida Escarpment using the Deep Discoverer remotely operated vehicle (ROV) and the linked Seirios camera platform. Map showing the area of the Central West Florida Escarpment where ROV operations will be conducted during Leg 3. The red teardrops are the approximate location of planned ROV dives. 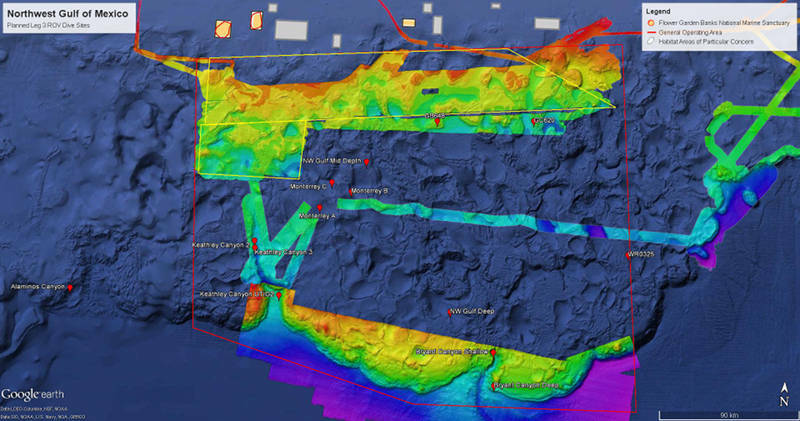 Bathymetry shown is from 2011-2012 Okeanos Explorer cruises. The area was identified as high priority for operations by multiple management groups. Image courtesy of NOAA Office of Ocean Exploration and Research. Download larger version (jpg, 583 KB). Map showing the area of the Northwest Gulf of Mexico for Leg 3 ROV operations. The red teardrops are the approximate locations of planned ROV dives during the expedition. The yellow boxes in the north of the operating area are where focused mapping operations were conducted during Leg 2. Bathymetry shown is from 2012 and 2014 Okeanos Explorer cruises, and the Extended Continental Shelf Initiative. The area was identified as high priority for mapping operations by multiple management groups. Image courtesy of NOAA Office of Ocean Exploration and Research; Extended Continental Shelf data courtesy UNH CCOM. Download larger version (jpg, 1.0 MB). February 24 – Begin Leg 1 mapping transit from North Kingstown, Rhode Island. Conduct transit mapping operations en route to the Gulf of Mexico. March 4 – Start primary mapping operations at the southwest Florida Escarpment in the Gulf of Mexico. March 15 – Conclude Leg 1 in Galveston, Texas. Mobilize for Leg 2. March 19 – Depart Galveston to begin Leg 2. March 20 – Start primary Leg 2 mapping operations in the Northwest Gulf of Mexico. April 3 – Conclude Leg 2 in Pascagoula, Mississippi. Mobilize for Leg 3. April 10 – Depart Pascagoula and commence transit to Northwest Gulf of Mexico operating area. April 12 – First Leg 3 ROV dive. April 24 – Last ROV dive in Northwest Gulf of Mexico. Commence transit to West Florida Escarpment. April 26 – First ROV dive at the West Florida Escarpment. April 31 – Last ROV dive of Leg 3. May 1 – Ship arrives in St. Petersburg, Florida; Leg 3 ends. Via telepresence, live images from the seafloor and other science data will flow over satellite and high-speed Internet pathways to scientists around the country standing watches in Exploration Command Centers, tuning into the high-definition video using their institution’s Internet2 connection, or watching the live video on commodity Internet. Image courtesy of NOAA Office of Ocean Exploration and Research. Download larger version (jpg, 1.2 MB). The United States’ first and only federal vessel dedicated to exploration of our largely unknown ocean, NOAA Ship Okeanos Explorer conducts operations in a globally unique way, using telepresence to engage the majority of the science team from shore. Via telepresence, live images from the seafloor and other science data will flow over satellite and high-speed Internet pathways to scientists around the country standing watches in Exploration Command Centers (ECCs), tuning in to the high-definition video using their institution’s Internet 2 connection, or watching the live video on commodity Internet. They will join an expedition teleconference and log into a centralized instant messaging server to contribute expertise and help guide the at-sea operation in real time, extending the reach of ocean exploration to more scientists and students than could ever be accommodated onboard. A number of ECCs will be online for the expedition, including several ECCs joining Okeanos Explorer operations for the first time. These include: NOAA Headquarters in Maryland; the University of New Hampshire; the Inner Space Center at the University of Rhode Island; Stennis Space Center in Mississippi; the Pacific Marine Environmental Laboratory in Washington; Harbor Branch Oceanographic Institution in Florida; Texas A&M University in Texas; and the Meadows Center at Texas State University in Texas. Scientists are also expected to participate from a number of other remote locations, including Woods Hole, Massachusetts; Charleston, South Carolina; Austin and College Station, Texas; Beaufort, Greenville and Wilmington, North Carolina; Indiana, PA; Baton Rouge and Lafayette, LA; Tampa and Gainesville, FL; Philadelphia, Pennsylvania; Claremont, California; and Washington, DC. These scientists, and others on call if a discovery is made at sea, will add their expertise in real time to operations at sea. One of the hallmarks of this expedition will be the high-definition video provided from NOAA’s Deep Discoverer (D2)ROV and Seirios camera platform. When deployed from the Okeanos Explorer, D2 and Seirios will provide scientists and the audiences onshore with the very first video footage from many of the deep-water areas we’ll explore in the Gulf of Mexico. All expedition participants are anxious to see the spectacular habitats and marine life we’ll discover. A variety of seafloor habitats will be explored during the expedition including submarine canyons, salt domes, gas seeps, shipwrecks and deep sea coral habitats. 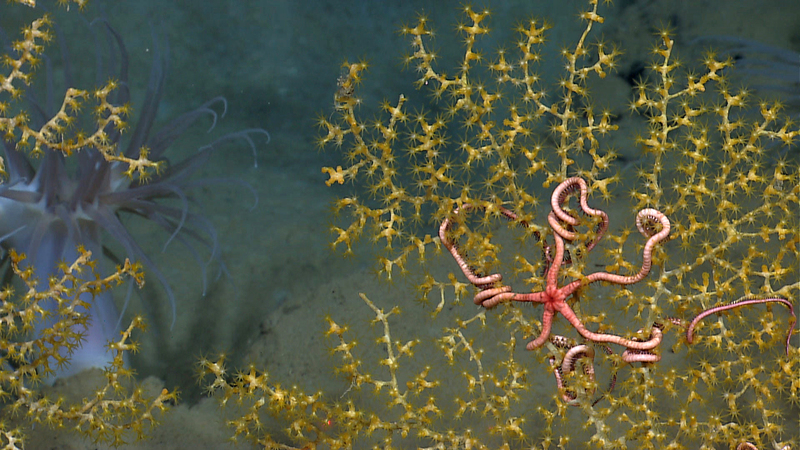 These brittle stars living on paramuricid corals were seen during the 2012 Gulf of Mexico expedition. Image courtesy of NOAA Office of Ocean Exploration and Research. Download larger version (jpg, 1.5 MB). This expedition provides unique and extensive opportunities to educators, students, and the public, bringing expedition-based materials and experiences directly into classrooms and to their fingertips. Education products specifically tied to the expedition include this website with content essays, daily updates, mission logs, and video and imagery; near real-time ship tracking features; and a Gulf of Mexico 2014: Expedition Education Module complete with standards-based lesson plans, ocean career connections, and much more. Naming every expedition partner in a telepresence-enabled mission is an incredible challenge! Many from dozens of institutions across the country have provided input into the expedition plan and expect to participate. Many, many more provide the technical and operational support that allows the planned operation to happen. Below is a list of some of the many partners and institutions who are partnering, participating, and providing input into the expedition in some way. External partners in this expedition include the Cooperative Institute for Ocean Exploration, Research and Technology; Bureau of Ocean Energy Management; Bureau of Safety and Environmental Enforcement; U.S. Geological Survey; NAVSEA Carderock Division; Gulf of Mexico Fisheries Management Council; Smithsonian Institution; Texas Historical Commission; Maryland Historical Trust; Ocean Exploration Trust; University of Texas at Austin; Texas A&M University; Florida Atlantic University; Harbor Branch Oceanographic Institution; Duke University; Mississippi State University; University of New Hampshire; Temple University; Woods Hole Oceanographic Institution; The University of Georgia; University of North Carolina at Wilmington; University of Louisiana; Louisiana State University; University of Rhode Island; Indiana University of Pennsylvania; University of West Florida; East Carolina University,; Claremont McKenna College; Montana State University; Geoscience Earth and Marine Services; C&C Technologies; Meadows Center for Water and the Environment; Texas State University; and Joint Office for Science Support of the University Corporation for Atmospheric Research. NOAA organizations participating in this expedition include the Office of Marine and Aviation Operations; Oceanic and Atmospheric Research: Office of Ocean Exploration and Research, Atlantic Oceanographic and Meteorological Laboratory – Argo Program; National Ocean Service: Office of National Marine Sanctuaries, National Centers for Coastal Ocean Science – Center for Coastal Environmental Health and Biomolecular Research and Center for Coastal Monitoring and Assessment Biogeography Branch, Office of Coast Survey – Atlantic Hydrographic Branch; National Marine Fisheries Service: Southeast Regional Office, Southeast Fisheries Science Center, National Systematics Laboratory, Office of Habitat Conservation – Deep Sea Coral Research and Technology Program; National Environmental Satellite, Data, and Information Service: National Geophysical Data Center, National Oceanographic Data Center – National Coastal Data Development Center; and National Weather Service: OPSNet Business Services.